Our Integrated Vici solution is ready to go live, and is available for Beta testing to any of our users using our Vici solution. It should be seamless and require no setup on your end, just shoot us an email if you would like to try it out. TLDCRM can now control VICIDIAL instances that we manage and maintain. We have written a high level service plugin for Vicidial that follows all their standards and takes some liberties with the data they provide. We did a lot of reverse engineering and you can be sure we will be adding more and more features as time goes on, particularly based on client feedback. Statuses and Custom Statuses can now be mapped to VICI Statuses. When Vici is enabled, you can set custom VICI Status codes in the Fields section when editing a status or custom status. This way you can choose the mappings, otherwise it will revert to default statuses we have selected to match our internal CRM statuses. Unknown statuses will default to”Other[O]”. Setting Status and Callback on leads emits an event we catch to pass to VICI, all Dialer work should not effect workflow for non dialer users. We can use these events later for other dialer integrations if needed! When Vici is disabled, but a user is Enabled via User Settings, that user will load all dialer resources where necessary. This is a good way to only allow certain agents to load the Dialer if you want to play around with it before giving it to everyone else. TLDialer will now show on the Agent Dashboard as a Button Link when enabled for the user or account. Load Lead on Incoming Call. Update Status on TLD Status Change. Disposition Vici Lead from TLDCRM Lead. Set Callback Disposition and Schedule from TLDCRM Lead / Callback form. Clicking the dialpad on a phoen number in a lead will initial a call when paused. It will search for a lead in Vici to load based on reference_id (VICI lead_id), vendor_lead_code (TLD Lead ID), and then phone number. If no reference ID is set in TLD for a lead found, it will updated it and connect the VICI lead to the CRM lead. Supports Letters! Converts letters to numbers for you. Currently happens via Dialer Pop, not via direct insert. We may add that option later. Lead must have both Reference ID (Vici’s Lead ID) and TLD Lead ID. Show countdown timer based on time the customer called in. Jump back to Current Call Lead while Navigating CRM. Show Queue List, with links to TLD leads where available. Fixed issue with Disposition Status 0, Trash. Now works. Fixed issue when refreshing session disconnects but cant get back in. Fixed issue with Pause not showing reliably. Working on behavior when you refresh the screen, currently disconnects like Vici native but sometimes leaves a stuck session. It is now possible up upload documents to the lead itself, alongside the policy documents. You must have upload_documents permission, or verifier or higher to view and upload. Allowed omnis to edit custom fields. Made it so that when you update the name on a lead the title in the tab bar changes with it. Added ability to Update Lead when a duplicate lead if found. This works alongside the attach notes / policies / dependents to lead feature. This field is meant to allow you to assign a lead to an agent to show up in the “My Leads” section. You can assign and Agent and set the Date Assigned right on the lead if you are an admin, superadmin or Manager. You can assign and set the date in the Mass Edit feature in the lead section as well. Settable date when you assign a lead to an agent. Can be used to calculate when it should no longer be that agents lead. We will probably create a background process that will reassign leads to the system user when a lead has expired. We may opt to use Campaigns to do this in the future! Will produce a link to lead a link. Added to lead uploader and post system. Will load and show an external image and also open the image on click. Dashboard got some visual updates. We standardized the links to look more like buttons. They are very large so they won’t be missed easily. We added the My Business buttons in the agent dashboard so they can easily be opened on mobile as well as desktop. You will also see your “My Filters” if any are set for quick access. The my leads section now works with the agent assignment system. This is great for agencies where manual distribution is necessary. This will make it so that when a dupe is encountered, it will attach any notes, policies or dependent to the duplicate lead. This will be shown as success code 2. You can use this to updated notes from other CRM’s where you have unique data in the system. When you upload leads we recommend to use the referrer and reference ID fields to mark the unique ID in another system so it is easy to update. This will allow you to upload leads and policies that do not have a phone or email present. Useful for bringing clients in from other systems where data is missing or not available. This will work in conjunction with the Dupe Criteria checkboxes. So if you choose Name as the criteria it will still check dupes, just not require a phone or email. If you choose phone and choose bypass, it will still check for phones but will check for a blank phone if none is provided. Made Mobile Quote Tool links easier to see. Tables can now be sorted by clicking the column. Tables now have total information in the footer. The system user should always be visible now and selectable and active. It will show (MASTER) next to it. We added a ton of life insurance based fields this patch, don’t worry though! If you don’t want them you can disable them in the Options section under Data and Hide Policy Fields. These new fields will give us more flexibility in the future and all have been standardized per our research. If we are missing some data options, please let us know! We added some new Policy Statuses! We also cleaned up some of the workflow (Which buttons show when). We tested it pretty thoroughly but if something isn’t working as intended please let us know. “Pending” Statuses no longer show up before Submission as most people have moved away from this workflow. To use a “Pending” status you should submit the policy, then move the Policy into the appropriate pending status. This way the Sale Date gets stamped on the lead because the policy was indeed submitted to the carrier at that point. You can reactivate the policy once it moved out of pending, or set it to a negative or other pending status. “Renewal” statuses related to payments now only show on Active policies, or Lapsed / Termed or other Renewal Policies. Normal payment issue statuses will show otherwise. They only cross paths on an Active Policy. All pending statuses now show as yellow “In Work”. As usual, you can disable some of these statuses from showing in the dialer section if you don’t want to use them. Policy is approved by underwriting but not yet placed or in force. Work on the approval process has been done by case manager, but waiting for underwriting. Client died and a death claim has been made. This is a generic payment issue for use after a policy is active as well as during the verification and submission process. Client has passed away and the policy is cancelled. Cancelled due to Wrong medical information provided on an app, MIB Report being different than the information on the app. This can also happen at the time of Death Claim. It would be the final status over Client Deceased if this was the case. The client themselves called and cancelled the policy. Workflow Theory for Life Insurance where Sale is made after Approval. This is for Child Only Plans, where the owner is the primary contact but the covered person is the dependent child. We have been working hard on the “Pricing” section of our Product system It has become exceptionally robust and allows for you to fill in premiums, enrollment fees and admin fees for nearly any combination of allowed options. We are looking into a way to lock users into having to choose the available options. At the start, they will be just clickable suggestions. We built this to grow in the future. We can add new criteria at will and make it as complex or simple as needed. We may even be able to use it for marking commissions or points. We have added tons of tools to make it easy to fill out the data. 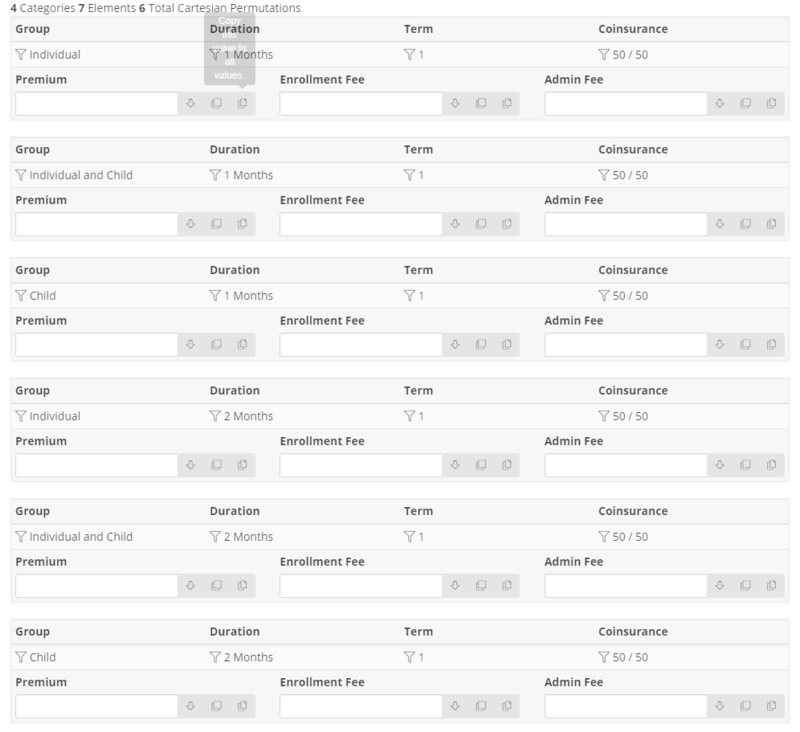 You can filter individual permutation columns so you can search for permutations that are the same and use our copy tools to auto fill the costs. You can auto fill either blanks in the same column, overwrite everything below a certain permutation’s column, or copy over all permutations in that column. This makes data entry a snap. We will be providing system standardized configurations for certain products in the future as we get them. You will be able to copy the defaults in with the click of a button if provided. 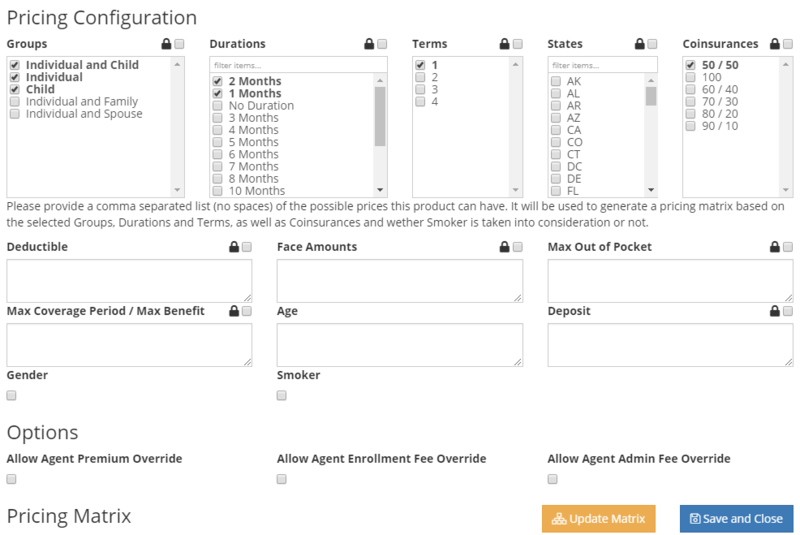 Here are some screenshots of our new Pricing configuration tool! We are really proud of this! These new fields can be added as validation rules in product configs. These new fields can be posted and uploaded into the system and have been added to the Vendor Post system. These new fields have been added to the policy schema and should work in the column builder. We have made some major modifications so that when you change carriers in the carrier select menu on the dialer screen, we now do a lookup in the database for any rules related to this product. This will provide us with many useful features to come (including some basic pricing auto fill capability). We originally considered hiding the menu option items outright, but realized this could cause confusion for agents and more reason to ask managers and admins where the heck their products went once they had these rules set. If the CONVERSION Validation section of a Product has the “User License Required to Sell in State” selected it will show a warning in brackets [STATE UNLICENSED] next to the product names that the agent is unlicensed in but WILL allow an agent to select it. This allows your agents to set a quote for someone before passing it on to a licensed agent. If you try to press “Sale” on that policy, it will give the unlicensed error since it was set to conversion. We recommend not to set License Required for Verification and Submission unless your agents self submit, so that your verifiers and submitters can continue to process the application as they do not require a license to do so. We now check, on change of carrier, the states required for each product. If a product required a state and no state is selected, it will disable the option and list [STATE REQUIRED] next to the product name. If a state is selected and the state is invalid it will disable and show [STATE INVALID]. These queues should help your agent understand why they can’t quote those policies. You can now set a comma separated list of zipcodes in product validations anywhere between 3 to 5 numbers long (yes we keep the front 0 for those pesky zipcodes that start with 0). Trying to quote, verify, or submit with an incorrect zipcode will give an error when zipcodes are provided as it would with states. If you change the zipcode to get around the limitation, it will still check for each part of the process. Try not to circumvent the system…if there is an error ask an admin to add the zipcode to the product config. We check from left to right, to allow you to take care of 3 – 4 digit prefixed zipcodes instead of having to type in all 5 numbers. This allows you to cover more territory with less work. For example: You enter: 330. This means that Zipcodes such as 33015, 33014 and 33025 will be valid. If you set 3301, then 33015 and 33014 will be valid and 33025 would be invalid. If you set 33015 as the zipcode, only 33015 would be valid. You can mass edit Zipcode validations. Leads Total and Notes Total added to lead schema and are now selectable in the column builder. Use it to build some reports with the aggregate Checkbox! Added Group Notes to Policies. Dependent Age Range added to Lead Schema and now can be searched in both Leads and Policies sections. Added Dependent Ages Combined and Dependent DoB’s Combined to Schema so you can get a list. “New Customer” was added to Schema. This is a customer that no policies sold other than on a single date. “Group State” was added to filters in Leads and Policies. Use this with the Aggregate checkbox to create some custom reports! Now showing Policy Status in commissions list. We had a client who discovered, while using the commissions tool, that the carrier had not paid two initial payments but was paying residuals. They recovered over $1,000! Fixed an issue with Typeahead for Editing Commissions after entered. Sales summary now shows total unique customers for the search (unique leads). Newer Table sections (leads, policies) will not convert to a list of cards instead of a table when a mobile device is detected. It also is responsive based on what device it is (iPad, iPhone, etc). We will update other older sections soonish. Fixed some styles on the Admin Dashboard main menu bar for mobile. Fixed Filters view on Mobile to fit in the Filter Bar. Changed behavior or Column builder so the screen doesn’t pop to top after selecting or removing a column on mobile. Does not pop up on Desktop either but continues to keep the filter bar highlighted. Added “Save” to column builder filter area so you don’t need to scroll down to update columns. Update column builder filter section to work better with Mobile. Modals are now full screen on mobile to allow for good editing experience. We added a simple vendor questionnaire with common questions you may want to ask a new Lead Vendor in the edit vendor popup. You can use this for research purposes or to just store information about the vendor. If you use it for research and decide not to go with the vendor you can simple deactivate that vendor. You can find it again later by searching for inactive vendors. Minor updates in this patch. Cleaned up Menu, tabs, and more. Hid new slider sidebar when in mobile view. Centered Name when in small view. Made medications and conditions textareas so you can see more of what you are typing. Made more responsive. Should be much easier to use. Most columns are now 2 x 2 instead of full width. Fixed an issue where you could not enter CC number when half screen. Most of these issues should have been fixed with the responsive update. Let us know if you find any more of those! Embedded products now respect state validation rules. Will silently fail if the state the primary is being created in does not fit the criteria for the embedded product. Fixed an issue where we were not using the product custom type, and always reverting to the product type. Product Custom types will now reflect in Sales Board, Profile and Policies sections. We may need to update a few more reports with this method. Added “Future Effective” policy disposition. This is for sales that have been made, and paid, have an in force date and effective date but do not go into effect until sometime in the future. Removed some spacing from top and bottom of header so you can fit more on screen. You can now set the beginning of the week to any day, not just Sunday or Tuesday. On Fire now has a Fire Effect. Please let us know if you receive any retina damage. Moved On Fire to top right corner of the cell it belongs in to keep the layout data cleaner and more even. Added “Stack Columns” capability so you can see two rows of data per agent. Added “Size” capability so you can change the font size of the main table for easier visibility. Reordered the Carriers Summary + the Sales Summary so Sales stacks on top of Carriers naturally, which makes for a more even table when there is too much data. Fixed an error when there was no results for the week. UX Update: I was getting annoyed adding columns then pressing backspace and having it auto-delete what I just added. So I made it require you press backspace 3 times before it starts deleting columns. Fixed an issue with the “Is Active Customer” column and search. Other results will not show (Unsold Quotes, Kicked Policies that were never sales, etc). Added “Has and Doesn’t Have” to Premium, Enrollment Fee, Admin Fee, Deposit, Policy Number, Application Number, Deductible, Terms, Current Term, Lapses In. Thanks new query system! You can now mass edit product validation rules. If you set no rules in a section, nothing will be updated in that section. Will copy all validation rules from specified product for every section: Conversion, Verification, and Submission, including State Validation rules. Will copy all validation rules from specified product, EXCEPT the state validation rules. This is useful for mass updating while maintaining state validations. The sales board has now been updated to treat primary and ancillary policies bases on the Primary ID being set. It also respects the system configuration for treating ancillary products as ancillaries even if it is a primary policy with no primary set. Commissions Paid has been added as a toggleable field either per day and agent or overall for the agent. The hybrid and contest sales boards have been merged into the main sales board. They can still be turned on and off and both required the contest date set. Pretty much everything on the sales board is now clickable. It will take you to the main policies page with a preset search based on what you clicked. Please let us know if there are any errors, although we did test thoroughly! This is a new section in the admin dashboard that allows you to see how many first touches on a lead an agent received during a certain period. This will also show you the total amount of unworked leads in the chart section, along side who worked what % of your leads that came in during that period. This circumvents the issue of not being able to pull reports based on Last Modified By, since the verifiers often become the new Last Modified By User when they get passed the lead to verify. We are pulling this data out of the action log and filtering out the system user, which is usually the first one to touch a lead. Hope this helps! This is the first step toward the Payroll module. This is a manual entry version of commissions paid to your agent, as opposed to commissions received, which is from the carrier to your agency (or agent). There are three ways to generate commissions and the final two ways are coming soon! Manually set the Commission Paid on the Dialer screen under a policy. This is currently active and selectable as a column in Policies sections. You can also use the Total and Average aggregate fields to build reports. This is simply a commission_paid column in the Policies table. Coming: More complex commissions payouts with the Payroll module, where you will be able to calculate hourly wages, bonuses, manager pay, and also deal with reoccurring commissions for agents who get paid monthly. This is the complex one since there are some crazy schemas for payouts out there. This will also work with the points system. Commissions Paid has been added to the Mass Edit policies screen. This section has been removed, and the “Commissions” section added. The bill me later option has been moved into the main policy section. This will keep the conversion data but prevent the system from throwing the error that the lead is already converted. This is useful for campaigns where there is an extra step in the lead process flow, but no policies being sold. Previously there was a workaround to this by using the Mass Edit feature.